Where do you start with a movie like “Killer Party”? Well we have three “gorgeous” babes going through hell night to join a sorority. A whole bunch of horny guys dump bees in the sorority’s back yard as a joke. Where, of course, a bunch of girls are naked in the outside hot tub during said bee attack. Their house mother gets talked into letting the girls have a hazing party in a forbidden frat house. When she goes there to make sure the place is safe, she first stops at a handy grave in the front yard to explain to ‘Allan’ why she’s letting the girls use the house (who ‘Allan’ is has not yet been explained). She tells him that it was all an accident and it’s time for him to just let it go. Allan doesn’t answer her, since he’s dead. Or is he? As she is nailing down a loose banister on the stairway, a mysterious figure appears before her, brandishing what looks like a tire iron, she turns, asks “What are you doing here?” and this person answers her by striking her dead. Back at the sorority, the three pledges go through a hazing (and there are some very nice set pieces here, watch for ’em), and are accepted into the sorority. One of the pledges is really good at special effects and she is told that the only reason that she was accepted was that skill. IN fact they want her to stage a traditional April Fools party that the sorority is hosting for a fraternity. Twenty-two years ago, the boy in the grave (“Allan”) was killed at one of those parties by what everyone carefully refers to as an “accident.” The girls talk about strange disappearances while they begin to set up the old house for the party, and more strange things happen. Will the youngsters figure out what’s going on and who is doing it before they are all horribly killed? 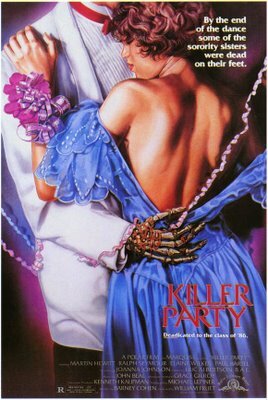 “Killer Party” is grade-A 80’s cheese and I loved every minute of it. From the campy opening music video number to the pink hair and the big glasses, this film is a loving tribute to everything that was wrong about the 80’s. It’s just plain fun and a hell of a good time. That’s not that everything here works. The film goes from slasher to supernatural possession thriller about 2/3’s of the way through and it makes for an interesting ending that doesn’t seem to fit the rest of the film. Nonetheless, you could do a lot worse than this little slice of sleaze Heaven. The slasher gods shine down nicely on this one.